The E-PL3 is smaller and lighter than the EP3 (in fact, the L stands for “Light”)… and the E-PM1 (M for “Mini”) is much smaller and lighter—a true “pocket” model, depending on the lens attached. As one might anticipate, given their respective differences in size from the PEN EP3, the E-PL3 has more external controls, while the Mini relies more on menu controls for managing settings. Low-light ISO scores are substantially lower (538) compared to cameras with the latest APS-C sensors (such as the Sony NEX C3 at 1083, more than twice as good). Dynamic range does not improve as much as expected at low ISO (+1 Ev compared with the next ISO step). The low-light ISO weakness of the Olympus PEN is particularly noticeable when compared to a Sony camera from the NEX series. 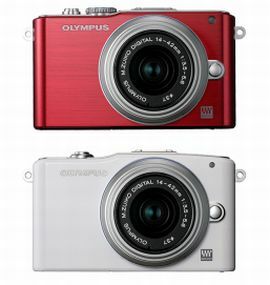 For example, if we compare the Sony NEX-C3 with the Olympus PEN E-PL3 and PEN E-PM1, the Olympus cameras are really behind with a score of 499 compared to the good 1083 score of the NEX-C3. This score makes the NEX-C3 a better camera for shooting in low-light conditions, but it is easily explained by the sensor size difference (micro-four-thirds for Olympus and APS-C for Sony). This size difference also makes the Sony NEX lenses much bigger and less easy to carry around. Among the Olympus PEN’s competitors, it’s interesting to take a closer look at the newly-launched Nikon 1 series. So let’s see how the Olympus PEN E-PL3 and PEN E-PM1 compare with the Nikon V1. The overall score is very close, but the size of the Nikon V1 works against it in low-light ISO, where it achieves a score of only 346. Apart from that, the 3 cameras perform very similarly. Even if these 2 new models in the PEN series don’t provide any improvement in image quality, they do offer new choices in terms of size and controls. Depending on the level of control you want, these 2 cameras could be very nice point-and-shoot cameras — portable, but with interchangeable lenses. So photographers interested in a portable second camera or beginners looking for a camera that can evolve with their level of expertise will want to take a closer look at these models.